As I mentioned in a previous post I recently joined the Spalding Bulb Blogger Club. Last week I received an email from the person managing the club inviting me to take part in a competition so with the weather preventing much outdoor distraction and the fact that I was fast running out of new ideas for a blog post, I decided to give it a go! 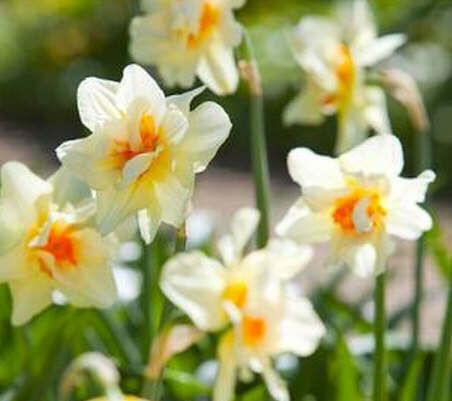 The idea of the competition was to choose five bulbs from the Spalding spring bulb collection that would create a lovely spring display in a patio tub and then to write a blog post about it. Obviously there was the restriction that I could only use bulbs from Spalding so my first task was to see what they had on offer. I discarded the collections of mixed colours as I wanted to control the colour scheme. 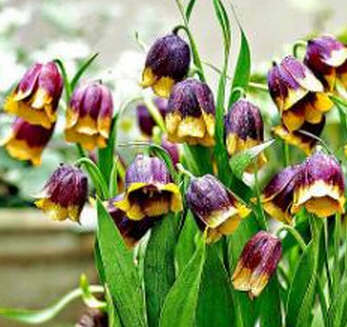 The bulb that took my eye was Fritillariamichailovskyi. It grows 15 centimetres high and flowers in April and May. Being a short plant it wasn't going to create a big impact but it provided me with my colour scheme which would be mainly yellows and purples. I also wanted all the bulbs to flowers at around the same time to achieve maximum impact. So my next task was to check out yellow and purple flowers which immediately brought to mind tulips. I wanted a dark purple tulip and there were three possible selections but I felt that two which could grow to 60 centimetres were too tall so I ended up choosing Tulip'Ronaldo' - growing to 50 centimetres. This was a bit taller than I wanted really but wasn't too tall for a reasonably large planter. Whilst browsing the tulips I came across another variety that I thought would combine well with the yellow and purple theme and also lighten it a little making the dark purple tulip have more impact. 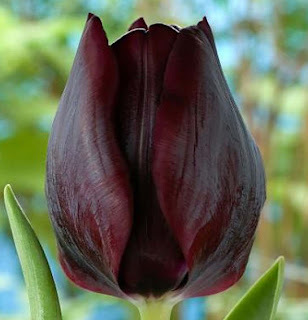 This variety was Tulip'Flaming Flag' which would grow to 45 centimetres. I now wanted to add more yellow as purple was starting to be too dominant and I also wanted to use different shaped flowers in the mix. Most so far had been a type of bell shape. 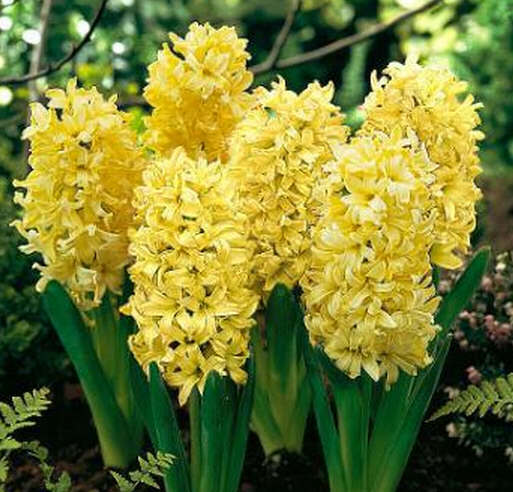 I came across a hyacinth that fitted the bill with the added bonus of providing perfume. On a patio this would be most welcome. The variety chosen was 'Yellow Queen' which grows to 20 centimetres. 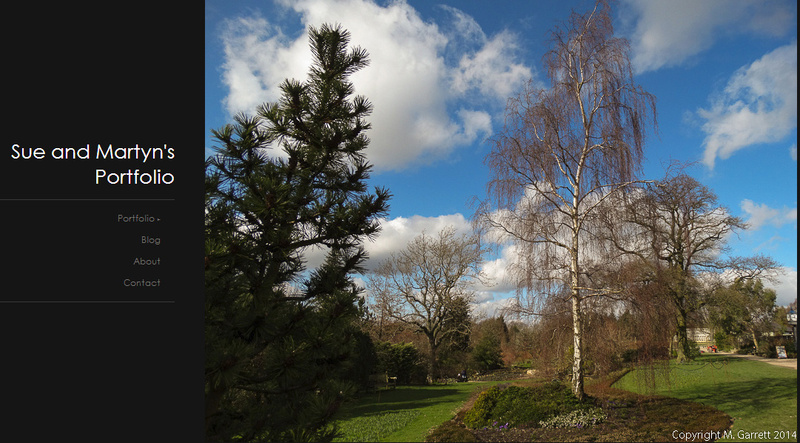 This would also provide a bit of a bridge in height between the taller growing tulips and the fritillaria. One variety left to choose and I decided that I wanted a narcissus of some type. 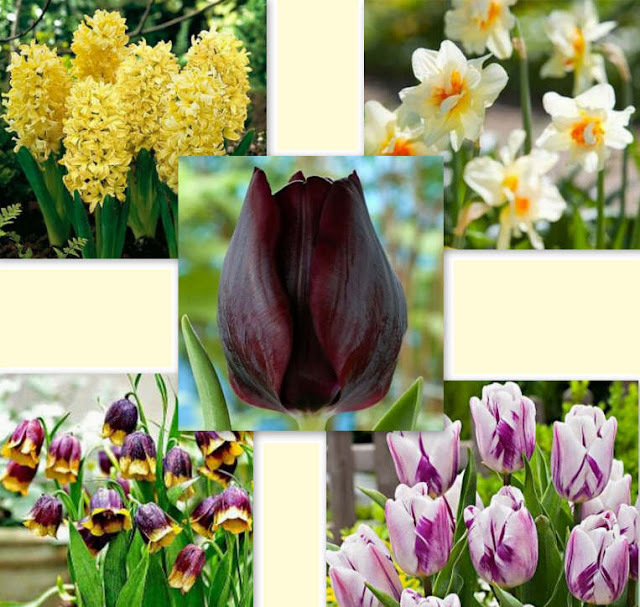 My choices were cut down as I needed a variety that flowered at the same time as the other bulbs chosen. 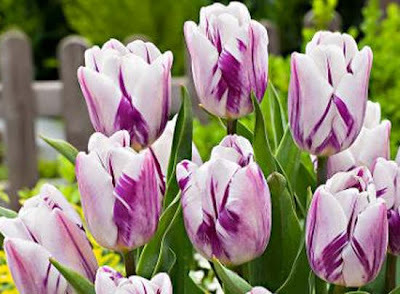 I also wanted to introduce more white into the mix so that the lighter coloured tulip looked to 'belong' more. I was leaning towards a miniature variety as this would have been a better height to provide a more gentle tiered look but the one that fitted this brief was Thalia which wasn't available as a separate variety. Then I spotted Double-Flowered Narcissi'Double Fashion'. Growing between 40 and 50 centimetres tall it is a bit taller than I would have liked but the colours link in really well and in a way seem to tie the whole colour scheme together also providing a different shape. So here's my final selection show together. Obviously it's too late now to actually plant it up but I could be tempted as it's a pity that I'll never really see the end product except in my imagination. I can really appreciate why a group of goldfinches have the collective name of a charm of goldfinches. They really do charm us. 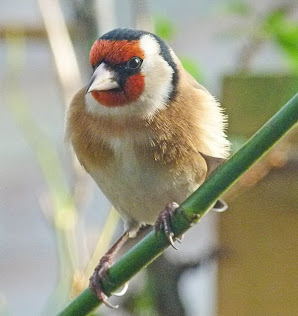 Recently Martyn posted a video that he had taken of the goldfinches that seem to have adopted our garden. Not to be outdone as the sunlight fell in just to right position I decided to try for some stills. The bird feeders that the goldfinches frequent are very near to one of our windows - about 1.5 metres away at most - but, just as long as we don't make any sudden movement, they don't seem to mind us standing by the window watching them. They just seem to stare back at us. Their favourite food seems to be the sunflower hearts which they go through at an alarming rate. The one above was queuing for a turn on the feeder. I'm not joking they really do seem to queue! Three birds at a time will tolerate one another on the feeder. Any more results in squabbling. The one above won't be hurried. As some of the food spills as the birds are feeding or as the wind blows, beneath the feeder we have a ground feeding table. Birds gather here often in quite large numbers - we have counted 16 goldfinches at one time - to clear up the fallen delicacies. The birds will happily continue to feed as sunflower hearts rain down on their heads. Then there are some birds that sulk because they are not centre of attention. One disadvantage of leaded windows is that it isn't always easy the capture the shot that you want so having birds that don't mind you pushing the camera up against the window helps as does keeping the windows clean! When I was up in the greenhouse yesterday I noticed that the garlic that I planted in a long tub is now shooting. No sign of the elephant garlic yet and I bet the garlic planted on the plot is keeping its head down! I know that this is off topic for my blog but I have recently read on one or two blogs that Blogger is starting to charge for photo storage. As a starting point it is worth reading what Blogger themselves have to say on their What are the limits to my account information? Generally I can't see any personal Blogger reaching any of the limits other than the photo storage which may be a case of not understanding how Blogger stores photos. 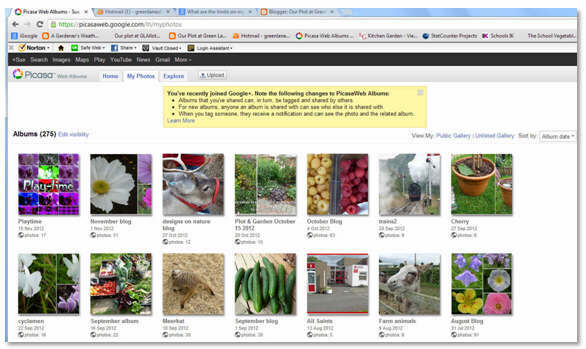 Blogger stores photos in a Picasa web album which is automatically created when you create a Blogger account. This is mine. You should be able to view your album by going to this link and giving your Google login when asked. 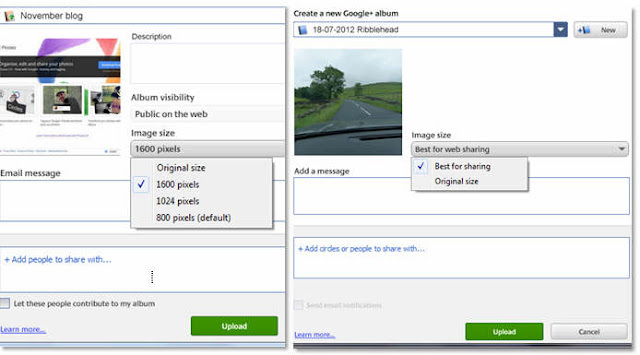 Picasa web albums has a storage limit of 1024Mb which may not sound a lot but consider this. As you know my blog is very picture heavy and I aslo have two other blogs which share this storage space but I have only used 27 MB (2.68%) of my permitted storage. Photos up to 2048 x 2048 pixels and videos up to 15 minutes won't count towards your free storage. 2042 pixels is very large but it may well be that your camera takes photos at a much higher resolution. My raw photos are 4320px x 3240px and each is 5.1Mb. If I stored the photos straight off my camera after 200 photos I would reach my storage limit. 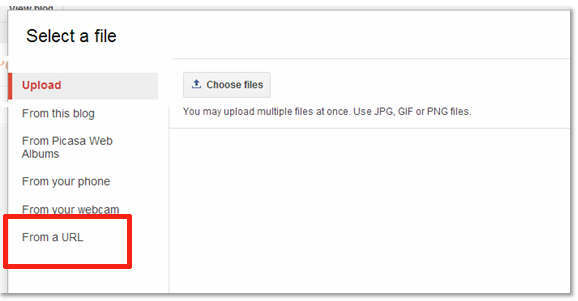 If you usually upload photos at their 'straight from camera' size by using the upload option below then it is likely that all of your photos will be above the free size. You could set up your camera to take lower resolution photos for your blog. 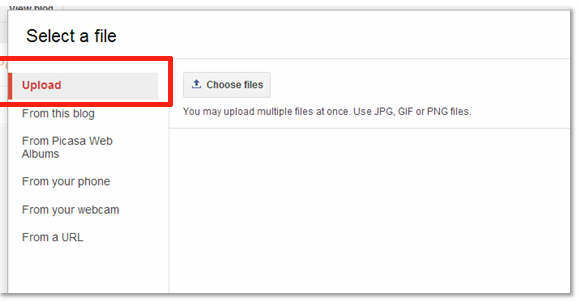 When you upload from the Picasa software you can set the upload size using one of the two options below. 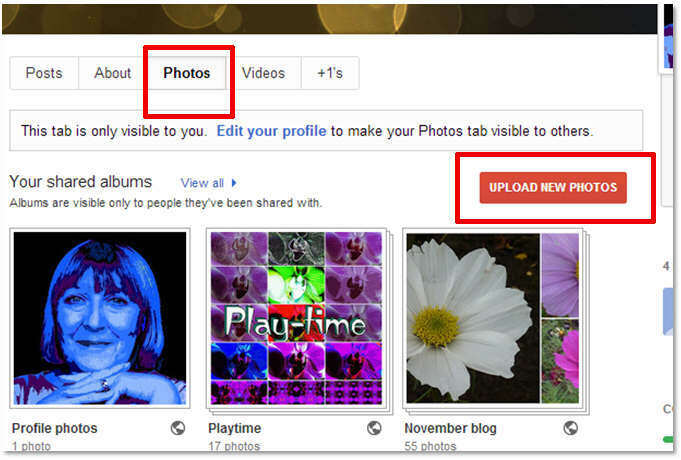 The one on the left uploads to Picasa web albums and the one on the right uploads to Google+ album. You could also save your photos in one of the other free online photo storage utilities but this would then involve copying the code into the html editing format in Blogger or adding the photo from the URL of the photo. Most free storage does have a limit like Picasa so read any information carefully to avoid any new shocks! delete any photos no longer required from Picasa web albums and make sure any new photos are below the storage limit. NB: Removing photos from your blog won't free up any space now will deleting posts as the photos will still remain in storage. 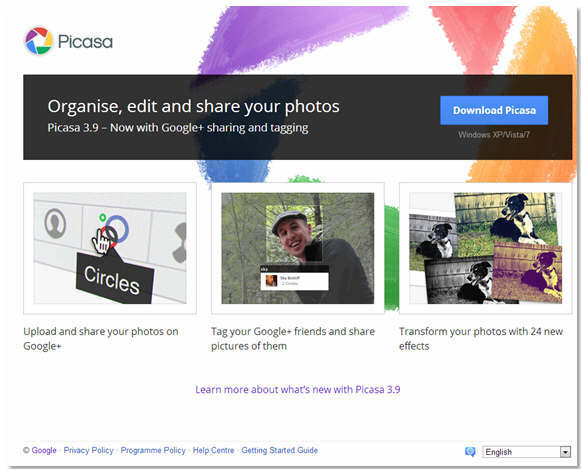 To delete photos you will need to login to your Picasa photo album. If you haven't reached your limit then if you change how you upload your photos as suggested then you shouldn't reach it! Hope this helps someone but if you need any more help email me and I'll try! 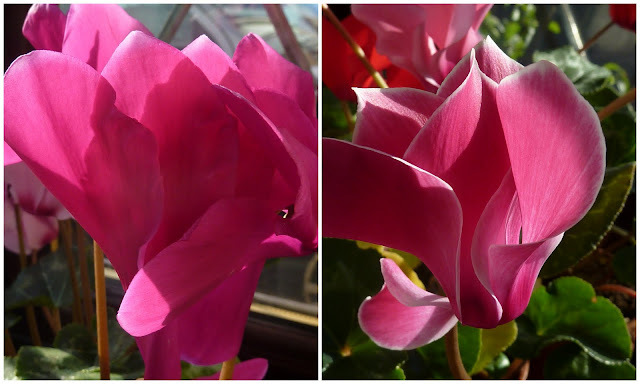 Last year as well as growing some indoor cyclamen from seed, I also grew some outdoor cyclamen - Coum. As regular visitors will be aware we already have quite a lot of hardy cyclamen in the garden but these are cyclamen hederifolium. They start to flower in autumn - the flowers appearing before the leaves. The leaves have a resemblance to ivy leaves which is reflected in the name (hedera being the Latin name for ivy). The flowers are similar to miniature sized indoor cyclamen flowers. Coum cyclamen first produce leaves and they are supposed to flower from December to April and both the leaves and flowers are different to hederifolium. The leaves are more heart shaped and the flowers more 'curly'. Last year I managed to raise five coum plants from seed which given the number of seeds in the packet was a bit disappointing. I haven't planted the small plants outside just yet. They have been growing in the cold greenhouse in small pots where they will stay until they produce reasonable sized plants. As it is growth is variable with some plants growing away faster than others. It isn't just the growth rate that is variable as the markings on the leaves are also quite different. The photos below show the variation. You may have noticed some flower buds developing on the plant in the top photo. I guess being inside the plants may flower a little earlier than usual. One plant has already produced a flower. I wonder whether all the flowers will be the same colour or whether like the leaves that will be variable? I described it as more curly which isn't really a perfect description but I'm not sure how else to describe the shape - any ideas? 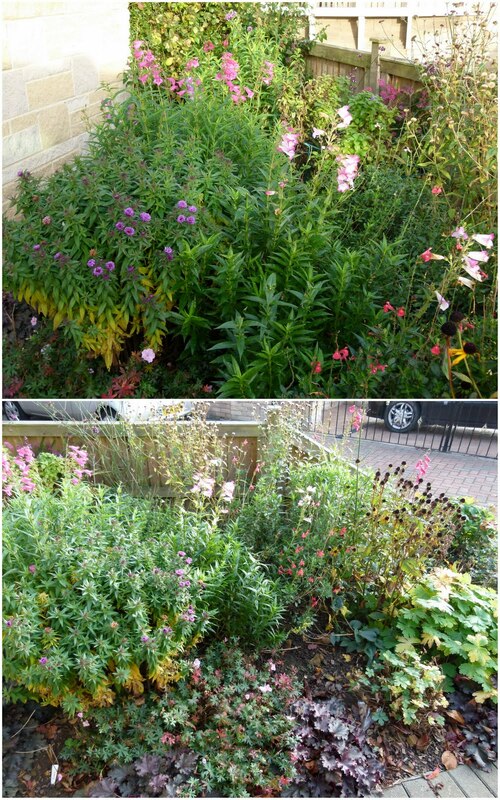 In a previous post I wrote about the plants that were refusing to accept that summer had been and gone but there are also those that think we must have had winter and that spring is just around the corner. How I wish they had got that right! Kelli in Northern Ireland wrote that the aubretia in her garden was already flowering. Although our variegated aubretia doesn't have as many flowers as Kelli's it is still making an effort. Only one flower but there are more buds. In the blue and white border one of the omphalodes (unflatteringly also called the navelwort) has also produced a couple of flowers. The flowers are a lovely blue. It's related to borage so the blue gene runs in the family. The laminum is providing the white element of the border. The flowers are a bit bedraggled but that doesn't seem to be deterring it as it is producing quite a lot of flowers. But then there were the bulbs planted on the 6 October. I planted some in pots which could be later transferred to the front garden. The idea is that once the perennials have died down and the bulbs planted last year have shooted, I should be able to place the new bulbs without disturbing those already planted. These bulbs are keen to make their mark and are already pushing to the surface. I do appreciate the plants efforts to bring a little spring into the garden but I really think that they may regret getting up quite so early! PS: Charms of goldfinches are certainly adding interest and colour to the garden at the moment. We could sit watching them for hours. 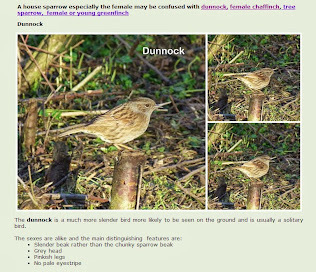 Martyn set up the video camera yesterday and has posted the results on his blog here. They look very at peace with one another but it isn't always the case as there is a fair bit of squabbling too. Our garden appears to be in a confused state at the moment. I think the plants are just having a little fun trying to defy the seasons. There are those plants that refuse to accept that summer has been and gone. Maybe they are still waiting, like us, unable to believe that last season's summer just never materialised. The roses still live in hope and are continuing to produce buds. Not an aphid in sight, no powdery mildew either but once these buds break open they will soon wish they hadn't bothered. 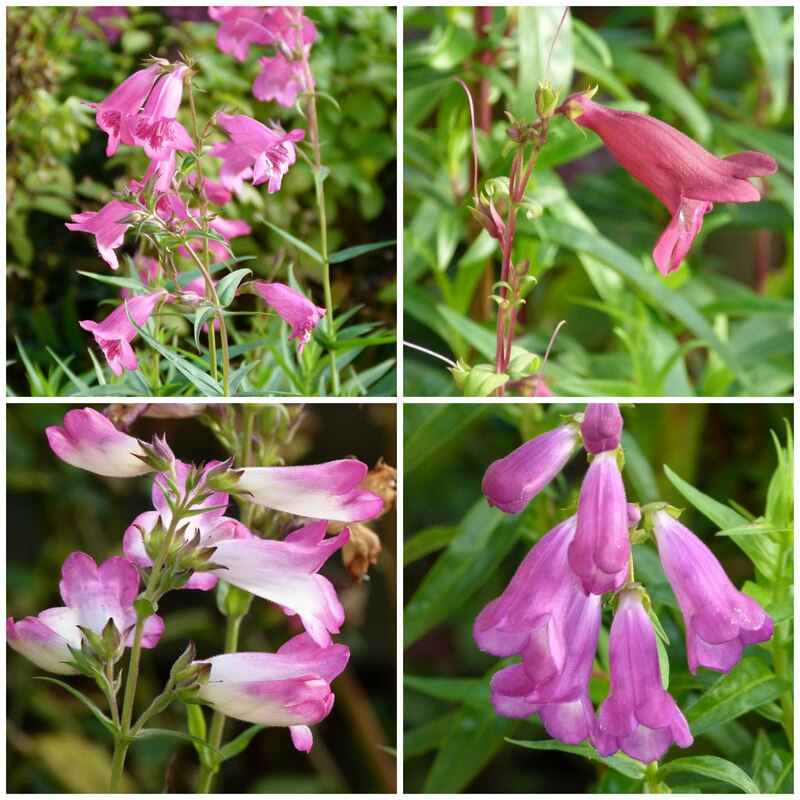 The penstemons in both the front and back garden are worth the effort as they continue flowering for such a long period. I've been really pleased with the planting in the front garden which has had interest colour from February and is still refusing to completely give in to the approach of winter. Then there is a newly opened kaffir lily that has sprung up out of nowhere - it seems to have sneaked along the edge of the white and blue border. It can stay there for now but will have to be moved. Pity it isn't one of the white ones but that would be pushing our luck as we only have red ones planted in the garden. So what do you do when it is too wet to garden? It isn't that it has been pouring down every day but the ground is sodden. Whether it is the soil in your flower or vegetable beds or the grass on your lawn or paths, wet soggy ground just doesn't appreciate being trampled on. Walking on soggy earth will compact the ground making it less plant root friendly. Once compacted, when our heavy clay soil dries out it becomes like concrete. So how do you occupy yourself when you can't be out and about in the garden? I've mentioned in a previous post that one of my orchids is flowering again. At the time of my last post the first couple of flowers were just opening but now all the buds are fully opened. So of course I had to capture the moment before it faded. But in the gloomy winter conditions it isn't easy to capture a perfect image indoors without using a flash. I tried lightening the photo below but it's a bit too bright and washed out! I didn't want to use a flash and so the photo below was taken by lighting the flowers using a large torch. The colours look so different. Ideally I'd love to be able to set the ISO and aperture settings on my camera to achieve the perfect result but, try as I may, I'm afraid how to set up my camera beyond the auto settings remains a mystery yet to be solved. So I decided to just play with my photos instead. Here are just some of the results of my playtime. The trouble is that once I start I just don't know when to stop! Please , can I have some more? Back in September I posted about the indoor cyclamen that I grew from seed last year and that had been an unexpected success. I also mentioned that some of the plants had maturing seed capsules that I was leaving to 'see what happened' and if possible that I would sow any resulting seeds to try and raise more plants. It's not that I actually need more plants but you know how it is - we gardeners just can't resist a fully ripened seed whispering "Sow me!" 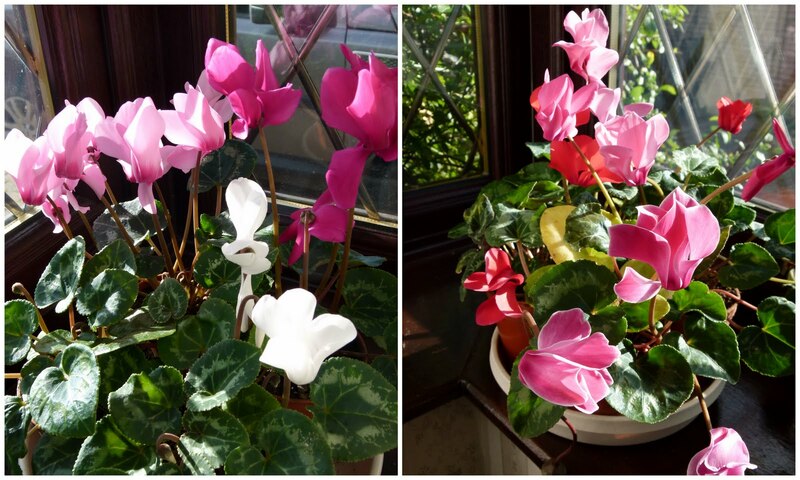 After a 'summer' in the cold greenhouse, the cyclamen are back in the house on one of our window ledges and, although one of the plants for some reason has developed yellowing leaves, are looking well. You will notice that I still haven't found an attractive trough style planter for them. When I was watering the plants a few days ago I noticed that one of the seed capsules had opened to reveal the seeds inside. The seeds in the capsule on the right are still enclosed. The seeds in the capsule on the left were obviously ready for sowing. In 'the wild' I suppose at this stage the seeds would be either carried off by ants or would fall onto the ground. Thankfully we don't have any ants in the house and so I decided to do their work for them and removed the capsule which I left to dry a little before I removed the seeds. As you can see, there were quite a lot of seeds inside. Just for Diana who likes to see what seeds look like - here is a close-up. I have sown the seeds in a small pot containing a mixture of multi-purpose compost and vermiculite. Then I covered the seeds with a layer of vermiculite and placed the pot on a windowsill inside the house. Now it's a case of sitting back and waiting to see what happens. 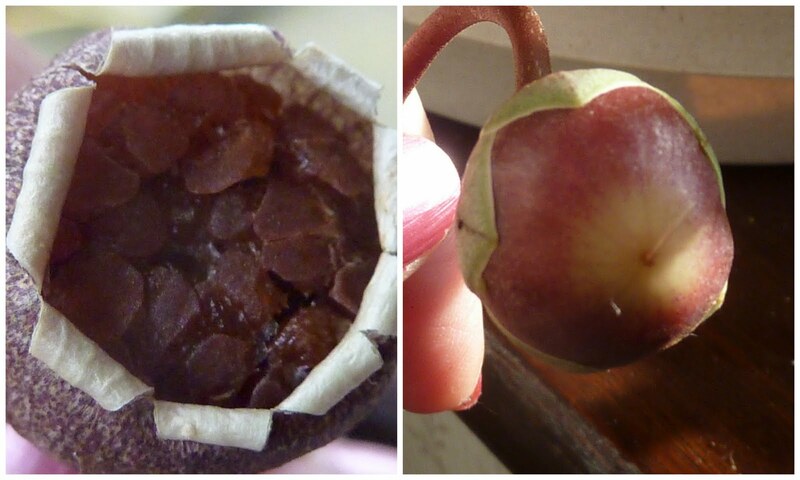 The seeds sown have come from a dark pink flower - shown below on the left - and the developing capsule is growing on a plant that has pink flowers with a white margin to the petals - as shown on the right. If the seeds do germinate and if any produce plants that go on to flower, I wonder if they will be the same colour as the parent plant or will they have cross pollinated to produce something different? I think I'm in danger of getting ahead of myself here - don't you? 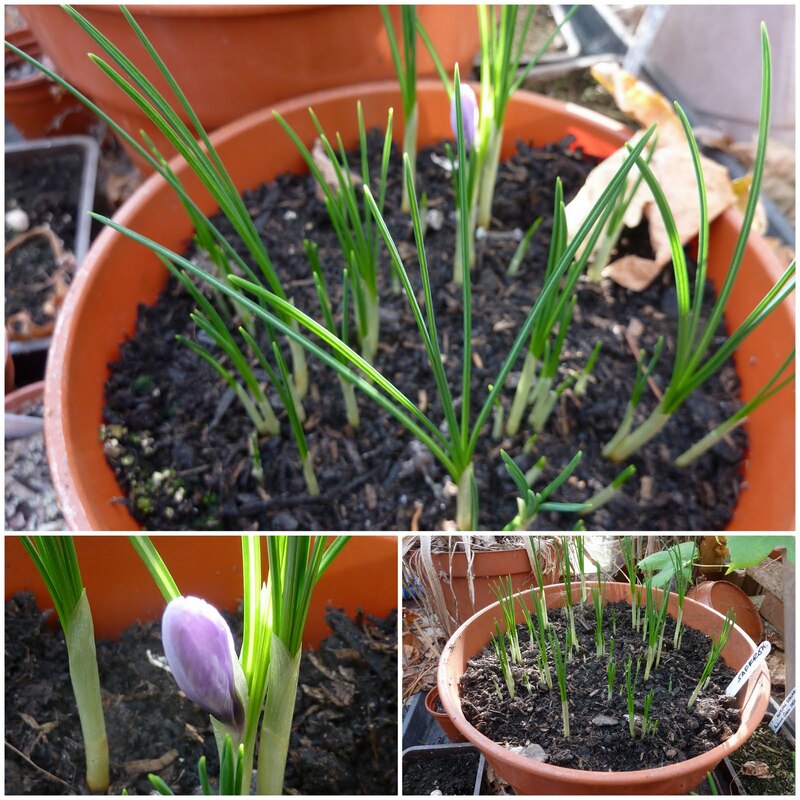 Our plot neighbours recently gave me some saffron crocus bulbs. They'd bought a pack and decided they didn't want to plant them all and so thought of me - thanks you Pat and Joe. Saffron crocuses seem very popular at the moment. Unlike 'normal' crocuses saffron crocuses flower in autumn. Not only do the flowers produce saffron, a spice that is really expensive to buy but they should also be perfumed. Ours is just starting to produce flower buds so I can't as yet confirm that. It's the stigma of the flower that produces the saffron strands so at the moment there are no signs of anything to harvest. Has anyone any tips on how to harvest and store saffron strands. Please don't tell me to cut off all the flowers! You may remember that last year I planted garlic in three different ways. I posted about it here. One lot was planted directly in the ground on the plot, another lot was planted in small pots to be transplanted onto the plot later and a third lot was planted in tubs that were like the pots kept in our cold garden greenhouse to be lifted outside at a later date. At harvesting time I found that the cloves planted directly on the plot and those planted in tubs out performed those that were started in pots and transplanted. The garlic didn't seem to appreciate the disturbance. Even though in the past I have grown garlic successfully in this way, I decided this year I would employ only the two most successful methods. Our soil is fairly heavy clay that can become very soggy during winter - last year the drier winter maybe provided better conditions for directly planted garlic but already this year the ground is very wet. For this reason I decided to have a back-up plan and plant garlic in tubs as well as planting outdoors. I also decided to restrict myself to just two varieties Early Purple Wight - a hard neck type - and Provence Wight - a soft neck type and also Elephant garlic. Cloves were planted outdoors at the same time as the autumn planted onions and in the same bed in mid October. I kept back a bulb of each ordinary garlic variety which have now been planted in a long trough. and five cloves of elephant garlic which have now been planted in a large pot. The cloves were completely covered after taking the photos. The number of people that make contact through my blog always amazes me. I guess that I am still amazed that there are people out there from all over the world that actually read what I write. I've had a few emails recently, one of which was from a company called Spalding Bulbs inviting me to join their newly formed Bloggers' club. In the email they sited reasons why I should join, one reason which appealed to me was that I would be sent free seeds, bulbs and plants to review. Now I like to try different things and this way I could do just that and for free. So I joined on the understanding that any review that I made would be honest and not necessarily positive. After joining, I was sent a list of plants from which I had to choose an item to review. For a while I've kept seeing adverts in gardening magazines for apples that have red flesh and have been intrigued but couldn't really justify buying yet another apple tree. Then along came the chance to get such a tree free, as on the list was one such apple - Baya Marissa. Shortly after placing my order the tree was delivered. The tree provided is a maiden which means that it is little more than a long rooted stick. 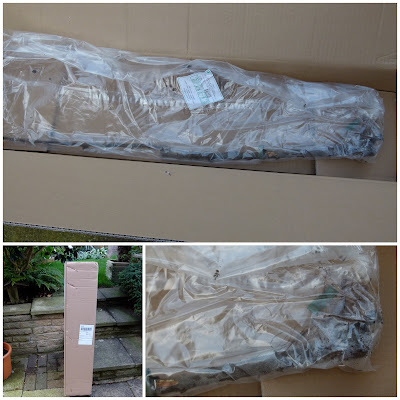 Although this is exactly what is described in the product description on the website, I must admit that, after buying two year old trees recently, the size was at first a bit of a shock. Then after consideration this apple is sold for £19.95 which is considerably cheaper than the larger fruit trees that I have bought. Also having browsed the Internet since receiving the tree, I have found that many suppliers don't actually state the size of the tree being supplied. The planting instructions stated that before planting the tree should be soaked in a bucket of lukewarm water and so we did just that and have now planted it up in a pot which will be kept in the cold greenhouse over winter to allow it to settle in. The tree could have been planted straight in the ground but we didn't want to do this. I had already decided that the tree would most likely join our collection of pot grown fruit trees rather than be planted on the plot and the description did say that the tree could be kept in a large pot. A feature of the tree is red blossom which means it can double as an ornamental tree. 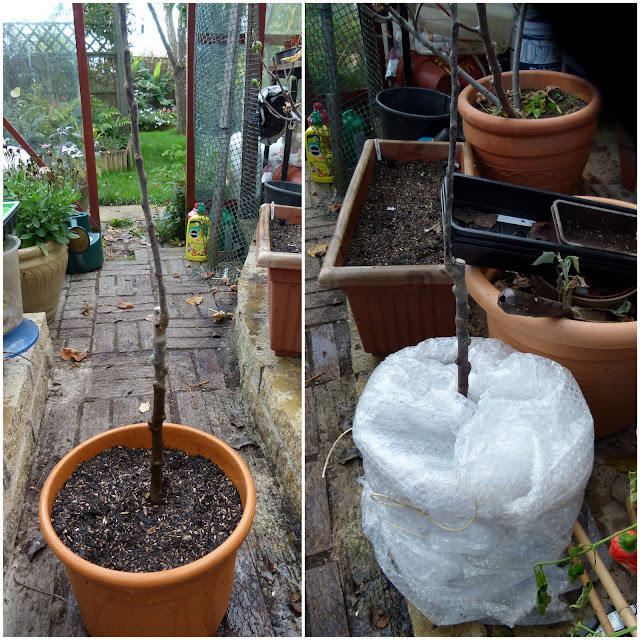 As for our other fruit trees I have wrapped the pot in bubblewrap to give some extra protection. I'll keep you up to date on it's progress. Spalding Bulbs aren't really a fruit tree specialist and have a very limited number of apple varieties which are mainly the sort that can be grown on a patio. 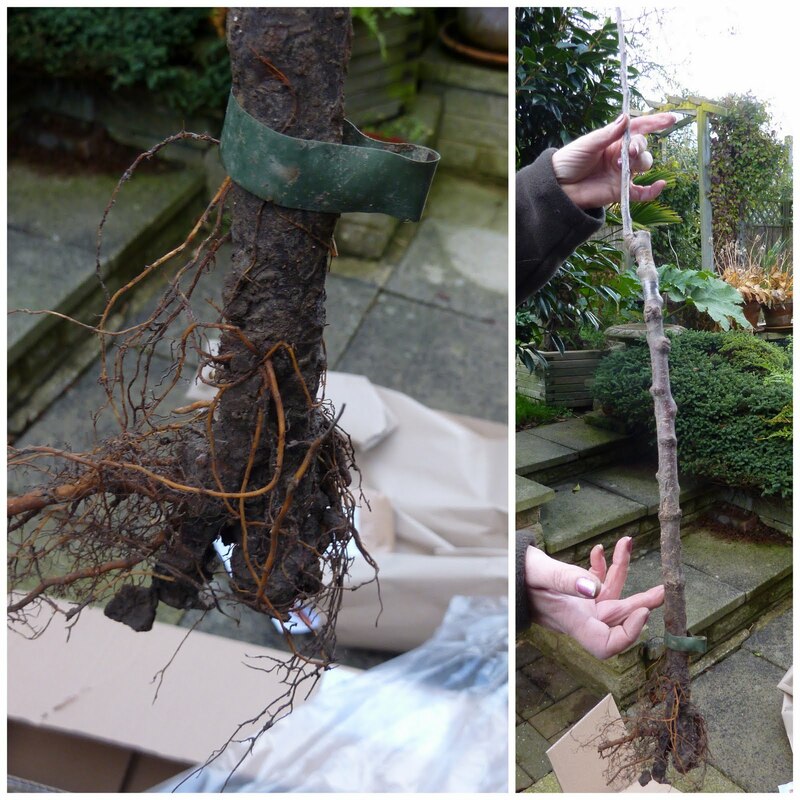 In my opinion, they don't really give as much information about the plants as I would have liked, for instance I had to email them to ask what rootstock the tree was growing on - an important consideration if you don't want a tree that will grow too big. Apparently it is grown on M26 rootstock which should be OK for container growing as the container will restrict the ultimate size. Since receiving the fruit tree I have been trying to find more information about the variety which is also known as Tickled Pink. One piece of important information that is missing from the description given by Spalding Bulbs is that the tree isn't self fertile and needs to be pollinated by another apple tree from the same pollination group. As I have two other varieties of apple tree in my garden and also two different crab apple trees I am hoping that this won't cause me any problem. Chances are that when growing an apple tree in a built up area there could well be suitable pollinators nearby anyway but I do think this information should be given when selling a fruit tree. I'm not anticipating any fruit next year but maybe in a couple of years time I can update you on what the apples taste like. You just never can tell.